In a perfect world there would be plenty of cavities and dead trees in forests for all the wildlife species that require them. However, young plantations and many natural timber stands often lack adequate cavities. This publication will focus on constructing and placing artificial nest boxes. Please consult WWW-14, Snags and Downed Logs, for details on increasing the number of natural cavities on your forest land. 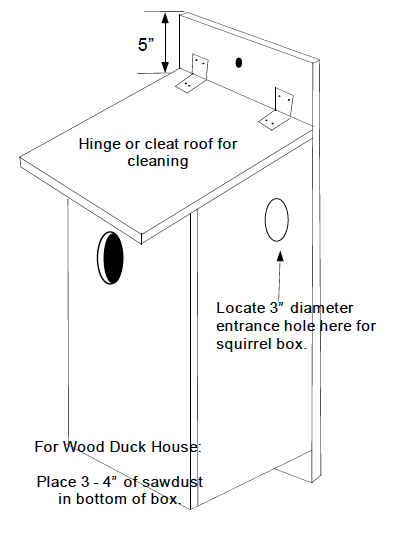 Dimensions for woodland nest boxes. Mount nest boxes in suitable habitat for selected species. Construct nest boxes using decay and weather resistant materials such as cypress, cedar, heart pine and oak. Place nest boxes in most critical (plantations and young timber stands) areas first, then expand efforts to additional areas as time and money allow. Use predator guards whenever possible and practical. Consult wildlife biologists for species requirements of species not listed in this publication. Habitats of woodland cavity nesters. Remove old nesting materials and repair or remount nesting structures annually following fledging period. Check ventilation and drainage holes for proper functioning during annual cleaning. Adjust mounting bolts and wires annually or as needed to account for tree growth or wear and tear.